This weekend I headed up to Leeds with my Guild-Ball-obsessed husband to visit SteamCon, the three-day-long celebration of all things Steamforged Games. As well as tabletop fantasy football game Guild Ball, Steamforged are also famous for their hugely successful Kickstarter campaign for Dark Souls: The Board Game, due to ship in April 2017. As I'm not very experienced at Guild Ball, this post might come off a bit like one of those news features where the BBC send a straight-laced, well spoken man in a suit to check out Minecraft or a new hipster cafe. Nevertheless, there's plenty to talk about even with my limited knowledge! We arrived at the Headingley Carnegie stadium bright and early to be greeted with the nicest convention goodie-pack I've ever received, containing a lanyard, patch, Guild Ball character card, metal coin and pin badge. 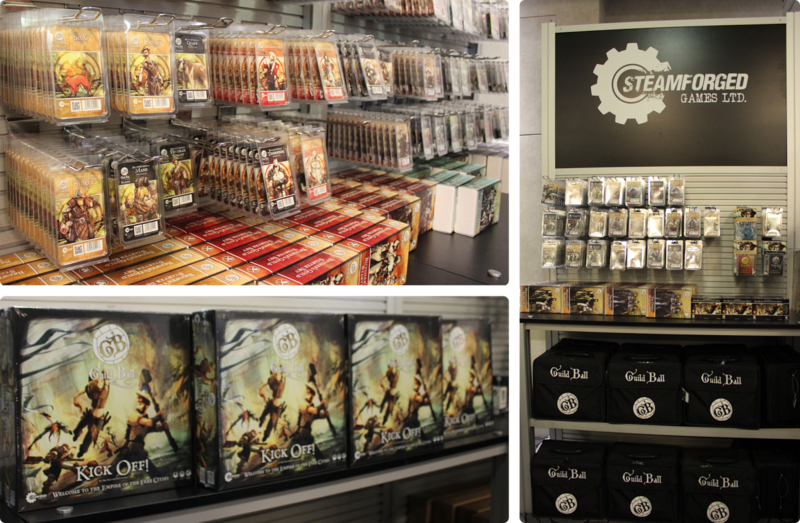 Heading up to look at the open gaming area, we quickly discovered the Steamforged Games portable store, where my husband was let loose amongst the racks of shiny limited edition models. Someone looked very happy after this little spree. Sometimes I think I'm not a terrible wife. My biggest purchase of the day was Shadow Games, a clever little bluffing game which takes place in the same world as Guild Ball, but you're working behind the scenes to secure enough favour (the little cubes) to sign the latest star Guild Ball player before your rivals. Since we had some time before the seminars started, I broke it open and went through the (gratifyingly short) rules pamphlet. I really enjoyed this game; it reminded me very much of a more complicated Love Letter, with a bit more strategy and a bluffing mechanic added in. We picked it up very quickly and were able to play a few games over the course of the day to fill in time when we were waiting for something else to start. My favourite parts of the day were attending the various seminars laid on by members of the Steamforged team. Even though I don't necessarily have all the background yet, it's always interesting to hear people talk about something they're passionate about and these guys are no exceptions. The first seminar we went to was about the Guild Ball universe and lore, with lead writer Sherwin Matthews. 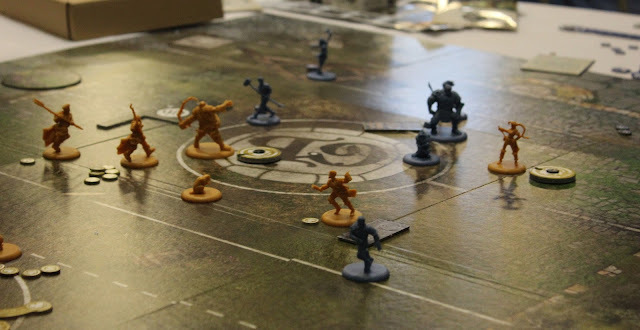 Before this, I had no idea just how much work had gone into the background for the Guild Ball world (the Empire of the Free Cities, I now know) and how big a part of the community the stories around the game are. I'm a sucker for a back-story, so I'll definitely be doing some more reading from now on. I still can't get my head around how Sherwin is able to create so much content so quickly on his own; what a talented chap! If you're interested, you can read the 'fluff' (as they call it!) from Season 1 of Guild Ball here. 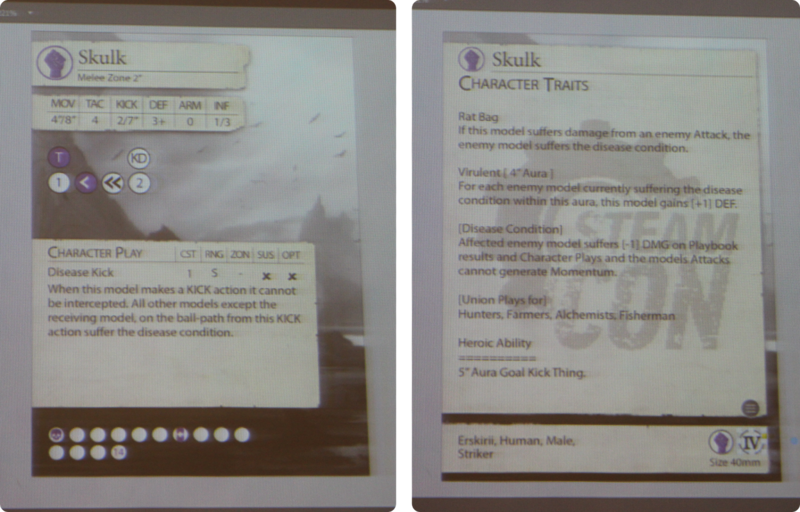 The idea of this seminar was to show how the design team move from character idea to finished player card. Later on at the keynote event it was announced that Skulk would become a production model and would be free in next year's SteamCon pack, which is pretty exciting having seen part of his design! It'll also be interesting to compare his final character card to the one we designed in the picture above to see what needed to be changed for balance. I was disappointed to have missed Russ Charles' model sculpting workshop on the first day of SteamCon, so it was great to get a second chance to see him on Saturday. This was a slightly different workshop, not based on model design but rather on giving demonstrations and tips for people interested in sculpting their own miniatures. Russ showed us the software tools he uses, but also offered suggestions of free/cheaper alternatives for home use including Blender and Sculptris. In between seminars we ventured across to the Long Room, where there was plenty of tournament play and open gaming going on. The room really does live up to its name! When we bought our SteamCon tickets we also booked in for a go at the eagerly awaited Dark Souls: The Board Game. Play-throughs were running two hours behind schedule, but luckily a kindly group offered to swap places with us so that we could play before having to go home - thanks guys! 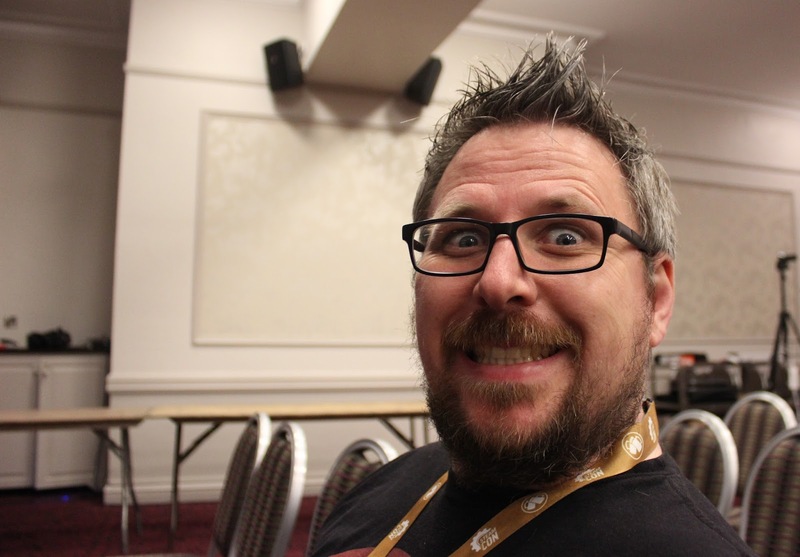 This really sums up the friendly atmosphere at SteamCon. I first tried the Dark Souls board game out in a tiny mini-demo at UKGE and (whilst we died horribly) I thought it was very clever. Things have come a long way since June, with the rules finalised and everything feeling very cohesive and ready to go. Sitting down for this two-hour playthrough with Alex Hall from the Steamforged design team gave us a much more in-depth view of the dungeon crawler and we were able to get a really good idea of how everything worked. Fighting your way through to the big bad boss monsters is no easy task, with fights getting progressively harder as you move through the ruins of Lothric. There's even a 'grind' mechanic where you get to reset your progress and fight everything again to get better prepared for the final fights. It's amazing how well the board game replicates the video game play. I love these character sheet boards with cube slots to show how much stamina and health you've used. For my original demo I had a dry-wipe pen on a sleeved card, so this is clearly a lot nicer and a great way to gather together everything you need to know about your character including stats, equipment and any special powers you have. The models in this game look amazing, although we were told they might not be quite as crisp after moulding; the ones we played with were printed. Some of these monsters are terrifying, as you'd expect from a Dark Souls game. I'm not sure how tough this Titanite Demon was supposed to be, but he made pretty short work of us (even with the cheaty equipment Alex gave us to show how this fight should go). Monsters move and fight based on cards, with the aim being that you learn these cards and plan your moves better because of it. For the Titanite Demon we had a whole set of cards to learn, which is fine until he reaches low health and the cards get shuffled, changing the order of the moves we had carefully remembered! In the end we did do a chunk of damage (mainly thanks to our moderate cheating). I'm not sure that's strictly in the rules, but everyone knows you climb up on to the giant bad guy and stab them in the head, right...? The seminar room was packed for the 8pm start of the Steamforged keynote event, which was also livestreamed to make sure the company's plans for the coming year were shared with the widest possible audience. We were led through the key announcements for 2017 by Steamforged founders Mat Hart and Richard Loxam, all the while struggling not to give away too many unplanned spoilers! One big reveal was of the artwork and models for the new Farmers Guild, due out in April 2017. The models will all be made in pre-assembled PVC. I'm not sure how well I'll cope with having some metal models and some plastic, although if that's the price I have to pay not to glue any more, I might get over the pain! Over 5000 games were registered over the month-long event and ultimately Brisket took the final victory with a squeaky 51% of the wins. As a consequence of this result, a new Veteran Ox model will be released in February 2017. I guess we'll never know what would have happened if Fillet had won? There were some more new player announcements to come; here's Hag for the Fisherman's Guild and the rather creepy looking master-and-puppet combo Brainpan & Memory for the Mortician's Guild. We also think she looks an awful lot like Brisket - hopefully we'll get some more story soon to shed some light! There were a couple of Dark Souls announcements, with new expansion 'Tomb of the Giants' announced for 2018 and hints that in the future there would be new products set in same world. As well as increasing their convention presence in the next year Steamforged also announced SteamCon USA - I have no idea how they're going to fit it all in! Towards the end of the keynote we got a tiny smidge of information on a new miniatures game coming in 2017. Much to the (hilarious) despair of his design team, Mat Hart was clearly dying to drop some spoilers on the new IP. However, he was very well behaved and kept hints to a minimum (ish). My notes run as follows: "Fantasy, 25-30 model game, Gods died, essence plunged into earth, cataclysm, discover power gems, become part God, attract followers, band together. Mat likes list building and MOBA gameplay". I'm not sure there's much more I can add to that, really! It'll be interesting to follow what they've come up with. I'd say we'll definitely be headed back next year, but I may still be in some form of Dickensian debtors' prison working off the bill for all of those models... Excessive spending aside, this was a great convention - well organised, friendly and lots of fun. Hopefully Steamforged Games has a bright, shiny future and there'll be lots more SteamCon fun to come next November.